When is a chicken not an animal? Answer: When she's in a factory farm. 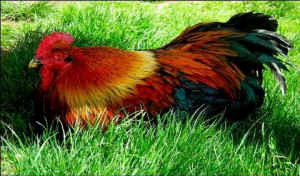 If she were, indeed, an animal, she would be protected by the Humane Slaughter Act, but the Act doesn't cover "poultry". That makes it easier for them to be dropped while still alive into the scalding water that helps remove their feathers. As we approach Thanksgiving and the Holidays, the ins and outs of how all this works is documented today in the Washington Post. The bottom line is that in their attempts to speed up the "line" of birds moving along the disassembly line on their way to the scalding water, some of the chickens and turkeys don't get their legs tied properly, so they don't hang upside down properly, and they try to lift their heads, which means they miss the electrified pool of water that's supposed to stun them, and then they miss the blade that's supposed to slice through their neck and render them deceased, and instead they land alive, upside down and usually with a broken leg, in the boiling water. On slaughter lines across the country, workers shackle the legs of live chickens and turkeys to hang them in place on the processing line before they are electrically stunned and a blade slices their necks. If they are not shackled or stunned properly, the blade can miss its mark and live birds are dunked into scalding water used to help defeather them. Researchers say the resulting death is far more painful for the birds than if they are properly incapacitated and their necks cut. It all sounds a bit like something out of one of those silly obstacle-course game shows where you have to climb the slippery slope to avoid being hit on the head by a soft hammer so you end up in the (not, in this case, scalding) water. Except that, in this case, we're talking about 825,000 chickens and 18,000 turkeys a year who end up being boiled to death. How do we know the number? Very simply, if the blood hasn't drained out, the boiling process leaves them looking bright red and they have to be "discarded" in case they become toxic to humans. "It’s so fast, you blink and the bird has moved away from you." And if the incorrectly hanging bird has moved on down the line, the next stop is the boiling water. At a Pilgrim’s Pride chicken plant in Georgia, for example, an inspector described being unable to stop a stream of live birds from being boiled to death. "I was unable to safely position myself to remove the birds at rapid line speed before entering the scalder," the inspector said in the report. "I proceeded to observe the automatic and backup killer and noticed there were numerous amounts of birds missing the automatic knife and the backup killer [worker] was not able to keep up." The proposal from the factory farm industry is to allow the birds to move down the line at a rate of 175 per minute for the chickens (up from the current 140 per minute), and 55 per minute for turkeys (up from 45). That's three chickens per second. So yes, absolutely, you blink and they're gone. "They are literally throwing the birds into the shackles, often breaking their legs as they do it," said Charles "Stan" Painter, a federal poultry inspector and chairman of the National Joint Council of Food Inspection Locals. "They are working so fast, they sometimes get just one leg in the shackles. When that happens, the chickens aren’t hanging right. . . . They don’t get killed, and they go into the scald tank alive." If chickens and turkeys were considered to be "animals" and were covered under the Humane Slaughter Act, this whole process would be illegal. It would be an "egregious" violation for them to be shackled when conscious, for their bones to be broken, and for them to be boiled alive. Meanwhile, there are many people who consider themselves to be vegetarians, or are making moves in that direction, and who have given up eating beef, for example, and "only" eat chicken. In fact, if you want to eat some kind of meat but are trying to reduce how much cruelty you're participating in, you're better off skipping the turkey and chicken and going with cows and pigs instead. But why find yourself making a choice between two rotten options. Skip the whole thing and move to a plant-based diet. 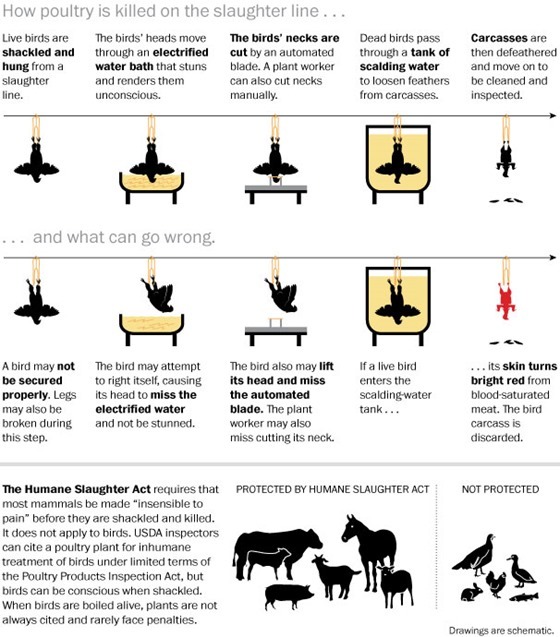 The Post has an excellent graphic (click here) explaining the whole gruesome process in their article here.